How much influence does the outer wrapper leaf of a cigar have on its taste overall? The wrapper comprises only about 10 percent of the tobacco in a cigar, give or take, but it seems to have a disproportionate effect on the blend. The question is how much of an effect, and the debate is perennial. Some seasoned aficionados say that the wrapper accounts for 60 percent of a cigar’s flavor. Others say less, some say more. But almost everyone agrees that the wrapper is a cigar’s most valuable player. The reason that wrapper leaf makes such a disproportionate impact isn’t exactly clear, but the fact that it does so is easy to prove. 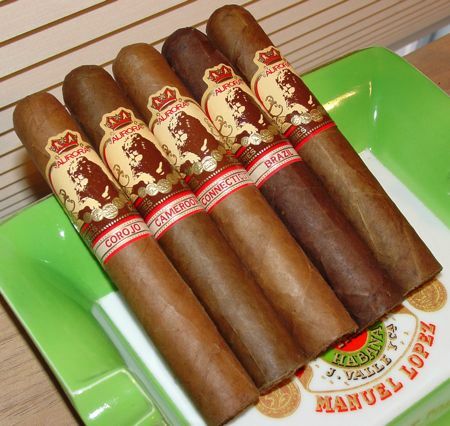 In 2007, Jose Blanco of Aurora cigars presented the Aurora 1495 Connoisseur Selection, a series of four cigars with exactly the same filler and binder, but each with a different wrapper. 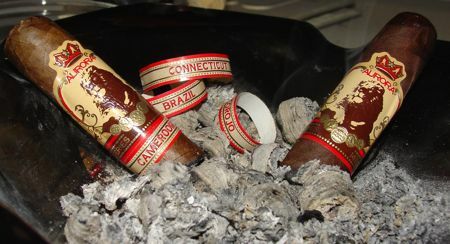 The standard 1495 cigar has an Ecuadorian Sumatra wrapper, but for the Connoisseur Selection the usual wrapper was replaced by four other familiar varieties: Corojo, Connecticut, Brazilian, and Cameroon. That these five robustos are not all the same is obvious from looking at them. The Connecticut and Corojo are claro in complexion, while the Cameroon and Ecuadorian are swarthier. And the rough dark hue of the Brazil stands completely apart. But under the hood they are all the same: a Dominican corojo binder which holds in place a blend of Dominican piloto cubano, Nicaraguan and Peruvian filler leaves. The core flavors of the binder and filler shine through in the Connoisseur Selection, but the wrapper lends each cigar a singular distinction; in effect, changing the wrapper makes each cigar an entirely different blend. Tart, somewhat papery with black pepper. Dry. Sweet and nutty aroma, caramel and vanilla overtones. Acidic/Citric. Gets a bit sharp after the mid-point. Becomes more leathery in the second half, but marked by black pepper. A little tannic and dry, but soft and creamy. Bready aroma with floral notes. Citric in the mid-section, then sharper with more pepper. Soft spice with some tannins, dry but not as dry as the others. A touch of pepper, but by comparison much more mellow. Minty note on the tip of the tongue. The mid-section is woody with toasty overtones. The last third is tart/dry with pleasant soft spices typical of Cameroon. Full-bodied maduro style — sweet and chocolatey. Some pepper on the the palate and gums. Woody flavors with some dryness after an inch or so. It doesn’t burn as evenly as the other blends — thick wrapper. The spice dies away in the mid-section, but returns in the last third. Fairly mellow and sweet, with a note of leather or musk. Earthy start, tart on the tongue. Dry. Sweet cedary aroma, becoming leathery. Black pepper in the sinuses, salty on the tongue. Becomes woodier in the mid-section. Complex with lots of changes. Potent with a lengthy finish and peppery/tannic aftertaste. The common denominators here are a tannic, woody dryness and black pepper. But considering that the only difference between each of these five cigars is the wrapper, the differences are staggering. The Connecticut is smooth and creamy, as you would expect, while the Corojo is spicier. The Brazil is sweet with chocolate and coffee-like notes, and the Cameroon has the run of the spice cabinet. It’s just what I would expect from these types of wrappers, but when combined with the rest of the 1495 blends, they create completely different cigars. I reviewed the 1495 corona a few years back, and since then I’ve found that I like the larger ring gauges in this line better — they’re a little bit smoother and not quite as concentrated as the corona. But of all the cigars in this collection I am most impressed by the standard 1495, the one with the Ecuadorian Sumatra wrapper. I can’t say it’s the finest wrapper of the bunch, but in combination with the rest of the 1495 blend, I believe it makes the finest, most complex smoke. The 1495 Connoisseur Selection is a brilliant hands-on way of seeing for yourself the role that a wrapper leaf plays in the flavor of a blend. I don’t know if it’s 60 percent, but it’s damn important. This is a crucial experiment to perform if you really want to understand the art of cigar blending, or if you just want to sharpen your cigar acumen. It doesn’t have to be done with this particular cigar, but why not? The 1495 is a great smoke in its own right. And to further your education even more, don’t miss the Stogie Review’s blind tasting of the Cameroon and Connecticut 1495, and a blending seminar with Jose Blanco.